Addressing the debt "will ultimately require increases in taxes or cuts in government benefits or services for people who consider themselves to be in the middle class," said CBO director Douglas Elmendorf. As head of the Congressional Budget Office, Doug Elmendorf has a knack for telling everyone on Capitol Hill exactly what they don't want to hear. Take the broadly defined middle class. All politicians swear to protect those in it from higher taxes and lower benefits. But that promise may be hard to keep if lawmakers are serious about curbing growth in the national debt over the long run. "Putting the debt on a sustainable path will ultimately require increases in taxes or cuts in government benefits or services for people who consider themselves to be in the middle class," Elmendorf said in a presentation at Harvard University last week. That's hardly the first time Elmendorf has said so, and it probably won't be the last. It's among the points that get lost in the hyper-partisan debate over debt . That debate, of course, has been lurching from one political extreme (Cut now! Debt will kill us!) to the other (Don't cut anything! Debt isn't a problem!). Of late it's been consumed with an academic study that sought to debunk any significant link between high government debt levels (90% of GDP or more) and notably lower economic growth, a key research finding by Harvard economists Carmen Reinhart and Ken Rogoff. And, of course, a major theme in all the arguments about deficit reduction is who should be made to sacrifice? 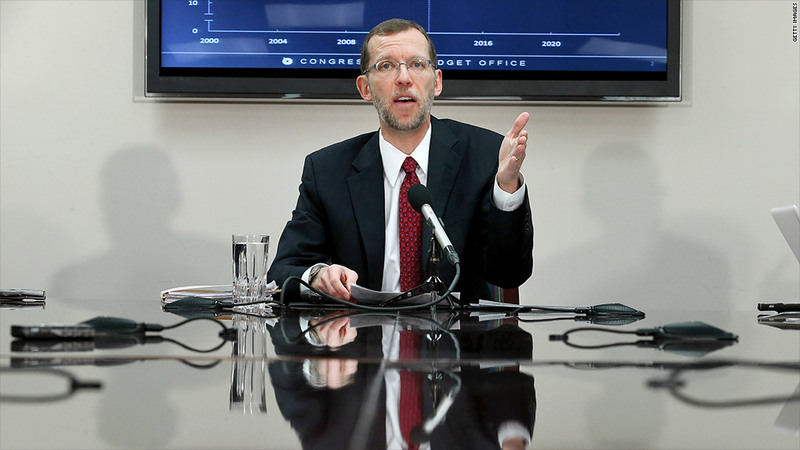 In a prior engagement in March, Elmendorf allowed that policymakers could take steps that wouldn't affect the middle class directly, such as taxing the rich and curbing benefits for the poor. Related: Deficits are falling. For now. But a "pretty wide cross-section of Americans consider themselves to be in the middle class," he noted. And given the growth trajectory of spending on entitlement programs, he thinks it won't be possible to spare the vast middle forever. 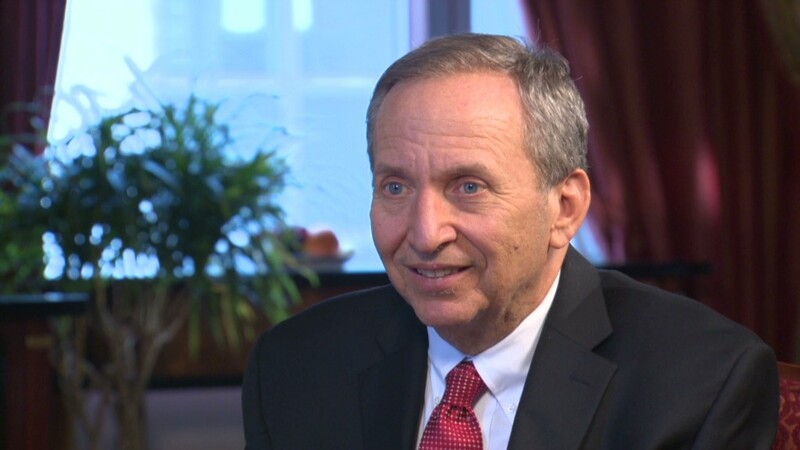 When measured as a share of the economy (GDP), taxes will soon top their 40-year average. But revenue still won't match total spending, which is projected to remain above its long-term average indefinitely barring policy changes, according to CBO estimates. That's largely due to two factors: spending on entitlements and interest costs. Outlays for Medicare and Social Security will jump to 9% of GDP by 2023, a 45% increase over its long-term average. That's not surprising, given the expected rise in the number of seniors drawing on those programs, a trend that will continue for a few decades. Fast growth in health care costs will further exacerbate the budgetary pressures between now and 2040. Spending on interest, meanwhile, will jump to 3.3% of GDP by the end of the decade, a 50% increase over its 40-year average. As for the rest of the budget? Spending in other areas is on track to either remain at historical averages or fall well below them, as is the case with defense. The Government Accountability Office now estimates that by 2030, incoming federal revenue won't be able to cover much more than spending on interest and the big entitlement programs, including Medicaid and health insurance subsidies. Meanwhile, federal debt will remain at historically high levels as a share of the economy. Elmendorf has a few concerns with that. One is so-called "crowding out" in the medium and long run. In other words, to support higher spending, the government must either raise taxes or borrow more from investors. That would leave less money for investment in the private sector and productive capital, such as factories. In turn, that can hurt economic output and incomes. Neither Elmendorf nor the CBO are in the business of recommending policies. But they are in the business of pointing out the potential pros and cons of various approaches. For instance, he noted last Friday, deficit reduction will hurt the economy less if it's done when growth is stronger. But even if lawmakers choose to postpone policy changes until the economy strengthens, that doesn't mean they can't make decisions about what should be done in the future. "The longer that we wait as a country to make the sort of choices that we have to make, the harder it will be ... because more debt will have accumulated, [and] people will then have less time to plan," Elmendorf said earlier this year.